Why isn’t Dodsworth better known, even among film buffs? It premiered in 1936 — a great year for movies — and it was nominated for the best picture Academy Award. Maybe if it had won, as it deserved to, more people would be aware of it. The actual winner, an endless, tedious “musical” biography called The Great Ziegfeld, would almost certainly be forgotten today without the dubious distinction of a best picture Oscar. Dodsworth’s other unrewarded nominations were for actor, screenplay, direction, supporting actress, and sound recording, and it should have won the first three as well. The only Oscar it did receive was for Richard Day’s outstanding art direction, which conjures up a trip across Europe on a series of Los Angeles sound stages, subtly echoing and intensifying the emotional states of the characters in any given scene. He’s driven home, taking a last look at the factory receding behind him. At his big, luxurious but cavernously impersonal house, he’s greeted by Fran, his wife. Fran, at least, has no regrets about Sam’s retirement. She tells him that they’re free to start life over from the beginning and she’s eager to go to Europe and leave behind “this half-baked Middle West town.” She’s spent the past 20 years raising their daughter and being a dutiful wife, belonging to dull women’s clubs and keeping up appearances. It’s supposed to be a pep talk for Sam’s sake, but there’s an edge of self pity and resentment in her voice; she brightens up when he calls her on it. She wants to start enjoying life, that’s all, while she still can. After all, she says, “no one takes me for over 32 — 30 even.” And in Europe, a woman such as her is just getting to the age when a man starts taking a serious interest in her. Sam reacts to this ludicrous assertion with a blend of incredulity, awareness and affection, but he doesn’t challenge it. He adores Fran and he’s ready to indulge her and learn more about Europe while he’s at it. And so the stage is set. You can feel what’s about to happen. The Dodsworths are a happy, devoted couple, but for 20 years that happiness has depended on their roles — he’s had his company and his career, she’s had their daughter and social position. Now, in middle age, the differences are starting to show. He’s open-minded, curious, action oriented, plain spoken and direct, and the giver in their relationship. She’s judgmental, superficial, deeply unhappy with herself and taking it out on others. The movie shows the fissures in their relationship widening sharply and alarmingly, with his patience and affection tested by her deluded and increasingly reckless behavior. She starts out by flirting with gigolos and ends up in full-blown affairs with wildly inappropriate men, subtly and then openly blaming Sam for it all because he’s middle-aged and unsophisticated. Walter Huston, as Sam, did get nominated, and won the New York Film Critics’ award for best actor. He’d played the role on stage and was legendary in it, but there’s no trace of staginess in his film performance. It’s not all that easy to play a virtuous character, and Sam isn’t just virtuous but a wealthy captain of industry without a trace of greed, ruthlessness or ego. Unlikely, to say the least. Huston disarms us and draws us in by showing the eager young boy who still lives inside the 52-year old man. Sam’s enthusiasms are sudden and unguarded, and so is his vulnerability. He’s not a fool — he has a shrewd understanding of other people, and nothing much gets past him. There have been lots of movies about the Ugly American, but Dodsworth is the Beautiful American encountering corrupt, cynical, decadent old Europe. He’s the idealized American of a vanished age, the sort of guy Ronald Reagan was playing when he acted the part of the president: tolerant, wryly humorous, deceptively tough and patient with the failings of others…to a point. Except that Sam actually begins to crack under the unrelenting pressure of his wife’s emotional abuse, and as played beautifully and sensitively by Huston, he goes through some very convincing stages of grief. The third great actor in Dodsworth is Mary Astor, playing Edith Cortright, whom the Dodsworths meet on the boat to Europe. Divorced and rootless, she lives in Italy because, she says frankly, it’s cheap. Like Fran, she has reasons to be bitter…but unlike her, she has accepted life’s inevitable disappointments and found a way to live with them. She’s open and direct like Sam, and becomes a friend to him as Fran begins to pull away. By the end of the film, the movie is all Astor’s, and you just want to be rid of Chatterton. In her memoirs, she noted that Chatterton was unhappy with her role, and fought with Wyler, because like Fran, she was faced with losing her youth. Interestingly, both actresses turned to writing novels when their acting careers dried up. In contrast to Chatterton, of course, Astor got the chance to prove her immense talent in dozens of movies over four decades, usually as a very complicated woman: Red Dust, The Palm Beach Story, The Great Lie, The Maltese Falcon, Desert Fury, Act of Violence, A Kiss Before Dying, and Return to Peyton Place (no, really) among them. Here, like Huston, she pulls off the difficult task of making decency interesting. She has a wonderful moment when she accidentally catches Fran murmuring sweet nothings with Arnold Iselin (Paul Lukas), a Eurotrash “financier” and ladies’ man. Edith, who really does have the old-world sophistication Fran tries to fake, sizes up the situation immediately. “My dear,” she says softly and gravely, looking Fran in the eyes, “don’t.” Astor gives this single word of girl-talk warning all the impact of a sudden smack in the face. In real life, Astor was undergoing a personal ordeal during the filming of Dodsworth: her divorce and custody battle were getting ugly and a purported diary full of lurid sexual details was leaked to the press. Years later, she said that playing Edith Cortright saved her — that she drew on Edith’s serenity and groundedness throughout the court case and its screaming headlines (Chatterton sat with her in court for support). Among other things, Astor underwent the humiliating experience of being called to producer Samuel Goldwyn’s office and being grilled about it by all the major studio heads, for whom she was a popular free-lancer. To his credit, Goldwyn kept her on the picture. In fact, the whole movie — a courageous exploration of serious themes without big stars or any other box-office concession — is to his credit. It wasn’t a financial success, but it was an artistic one; in a career full of tripe and misfires, this film and The Best Years of Our Lives are Goldwyn’s monuments. 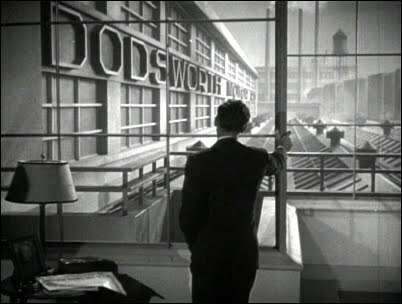 Dodsworth could have been made today, except for the sad fact that movies this beautifully written, directed and acted are even rarer now than they were then.